The Titan One device supports all official wired controllers for PS4, XBox One, Nintendo Switch Pro, PS3 and XBox 360 consoles and most of third-party wired controllers designed for PS4, XBox One, Nintendo Switch, PS3 and XBox 360. The general rule is: if the controller works on PS4, XBox One, Nintendo Switch, PS3 or XBox 360 it also should works with Titan One. Game specific controllers like guitar controllers and wheel controllers are not supported. 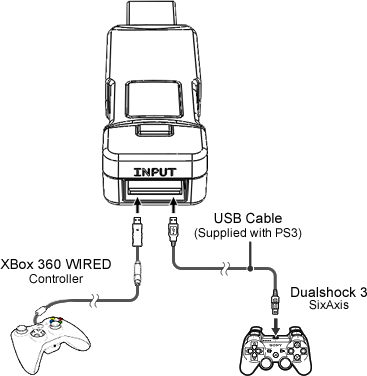 For a list of supported controllers please refer to Compatibility List of Controllers. Your wired controller is working properly when the display shows 0 with no dot at the bottom. A blinking "E" with a dot at the bottom means your wired controller is not supported.